Some users (especially first time users) ask completely rubbish questions, such as https://askubuntu.com/questions/486830/wi-fi-on-ubuntu-14-04-hp-g70-laptop, they say "unfortunately wi-fi is not working any ideas on how to fix this". It is one of the broadest questions I've seen, and it's quite frustrating. Which gives them more prompts etc. It could be the default for users who have less than 20 rep, to avoid annoyingly uninformative questions. If they got 100 from as an association bonus, then that would be included (i.e. they wouldn't see it), unless one of their questions is flagged, and then they see it, until they had earned 20 (i.e. had 120). I understand your point about how users think of this as a forum, but there are efforts being made. It isn't that big of a deal to click "close" and type two sentences as a comment (if there is none already). Heck, you can even have a list of possible comments to add. Also, what if I had the question Difference between gksudo and sudo, why would you ask for a screenshot? IIRC there's some guide that pops up for new users that's how to ask, but I can't seem to replicate that (duh!). What's the difference between gksudo and sudo? I noticed sometimes you use gksudo for root privileges and you can also use sudo. Is there any difference? I don't know, asking you? When did it start? Did you install anything? Could you provide a screenshot or a link to an image? That probably is something close to what might actually happen. 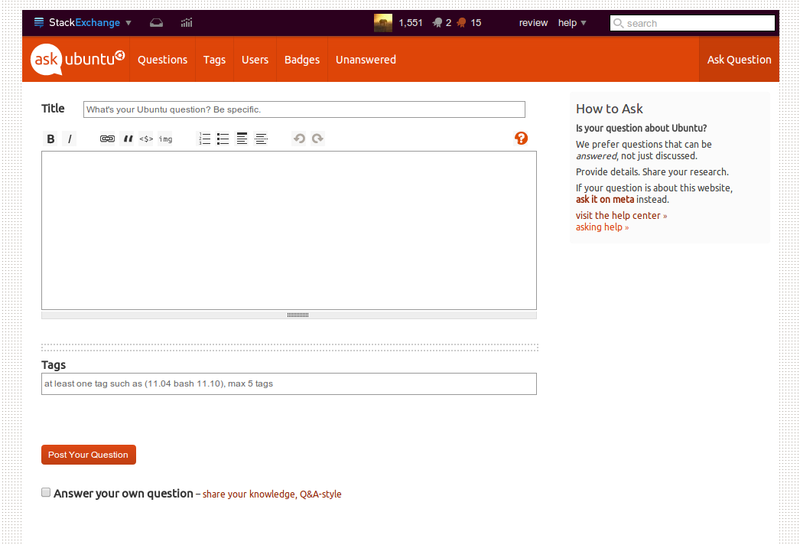 Other users might get discouraged and go to Ubuntu forums (yuck!). Not to mention, linking images is a bad idea if the linked site goes down. I absolutely think that this could work. The form-like suggestive questions may help give clueless posters an idea of what to put in their questions. Using seperate boxes for each question might help the OP write without adding in extra mush. It's like filling out paperwork. I would suggest perhaps in addition that a box be added to the side, that give suggestions for additional information based on keywords you've typed, or what you've tagged the posting as. For example if the OP types "Windows won't boot" for the first question box, then the suggestion-box might read "It may be helpful to mention what version of Windows you are running." That's a bad example since it's about Windows, but I've got Windows on the brain right now. Not all questions would trigger a suggestion, just some basic common ones. The problem is that you are focusing in the the troubleshooting part of the site, and not all the questions are about troubleshooting (and I really hope they ever will). What people needs more is to use the downvotes/flags/votes to close with questions that are not up to the quality standards. This is what it should be done. The askers at some point of time will ask better questions. Not the answer you're looking for? 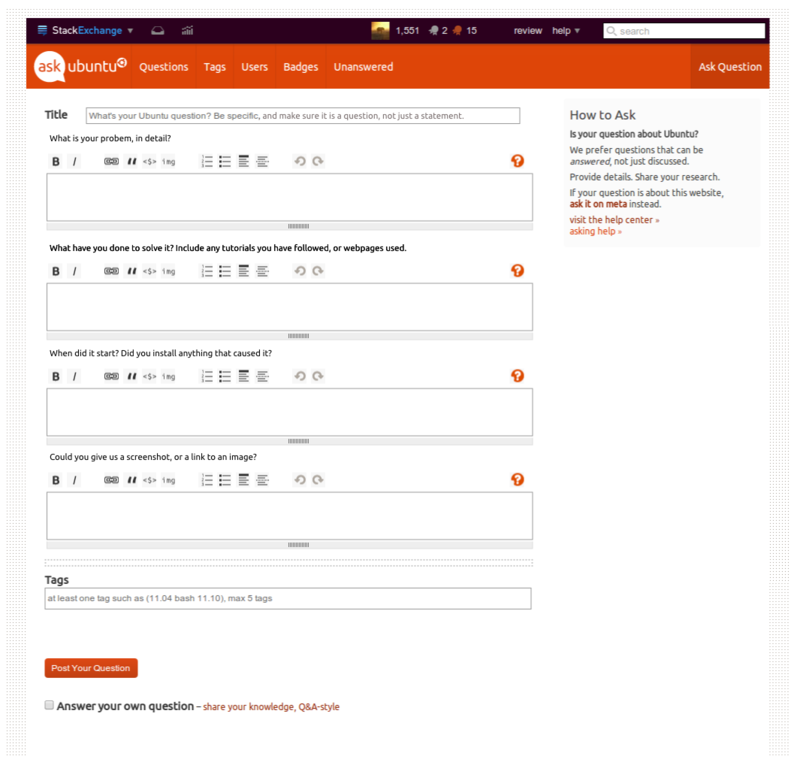 Browse other questions tagged discussion feature-request asking-questions new-users . Ask* sites have a serious misconception in their basis. What happens with expert newcomers? How can I eliminate irrelevant (and obsolete) answers?